Uruguay's Luis Suarez did a peculiar thing in his nation's 1-0 victory over Italy today--he bit an opponent on the shoulder. Making a play on the ball alongside Giorgio Chiellini, Suarez took chompers to flesh, and then flopped a few seconds later to look like he wasn't at fault. 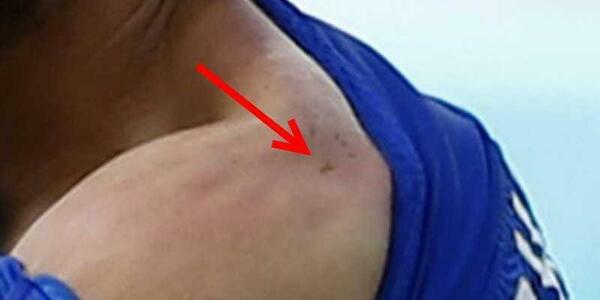 Except, bizarrely enough, this is THE THIRD TIME Suarez has bitten a player. He's missed 17 combined games due to biting, so he's likely done for the entire World Cup, and then some. Giorgio Chiellini pulls down his shirt to show the bite marks. However, Suarez was not removed from this game at all, and Uruguay went on to win. That qualifies them for the knockout stage and bounces Italy from the tournament. This isn't the first time Suarez has found himself in a World Cup controversy: in 2010, he committed a handball on the goal line to keep Ghana from scoring. He did receive a red card then, but Uruguay won in a shootout to advance to the semifinals.